• European markets have been thrown into turmoil amid several sovereign risk rating downgrades. • Concerns are mounting over the ability of governments to fund their fiscal deficits, especially in Greece, Ireland, Italy, Portugal and Spain. • We are witnessing a serious crisis of confidence, exacerbated by Greece’s need for EU/IMF support. • Key areas of focus include: political developments, effects for the corporate sector and exchange rate risks. • The sovereign debt crisis entails both risks and opportunities for companies exposed to these markets. • We recommend increased vigilance, especially with regard to payment risks. • Background: What is Happening and Why? • Outlook: What Will Happen Next? If your company is trading in the PIIGS (Portugal, Ireland, Italy, Greece, Spain) and other euro-zone economies, or if you are planning to invest in these markets, we recommend you keep the following points in mind: the importance of looking at country risk rather than just the much more narrow sovereign risk; increased payment risks and the potential for tightening payment terms; the need to closely monitor developments in the PIIGS even if you are not directly exposed to them; protecting against exchange ratevolatility through currency hedging. look at the political, economic and commercial risks affecting businesses dealing in a country. It is this mix of political risks (e.g. weak government effectiveness), economic challenges (e.g. fragile domestic demand) and commercial factors (e.g. deteriorating payments performance) that companies exposed to the PIIGS should be aware of, not just sovereign risk. 2. We advise companies to monitor their exposure to euro-zone countries carefully. Rising insolvency levels have increased the risk of non-payment in the most vulnerable countries. Given weak payments performance trends by companies in the PIIGS, companies might want to tighten payment terms with counterparties in these countries. 3. The risk of contagion even beyond the PIIGS remains a problem due to the interconnectedness of European production and supply chains. Even if your company is not exposed to the PIIGS directly, it is advisable to closely monitor country risk developments in the PIIGS. 4. In light of increased exchange rate volatility and the uncertainty about the euro, currency hedging might be a useful strategy for companies exposed to euro-zone trade in order to protect themselves from increased volatility. Background: What is Happening and Why? In late April European markets were thrown into turmoil following sovereign risk rating downgrades of Greece, Portugal and Spain by sovereign ratings agency S&P. Greece’s rating was even cut to below ‘investment grade’ status. This followed several downgrades of Greece and Portugal by sovereign ratings agencies in recent months amid rising uncertainty about public debt. The latest series of downgrades was fuelled by new data that revealed that Greece’s budget deficit exceeded 13% of GDP in 2009; the country’s lack of transparency about the scale of its debt burden has been a constant risk factor, with the government regularly revising its budget figures downwards. D&B Country Risk Services, which looks at political, economic and commercial risk factors affecting countries across the world (in addition to sovereign risk, the key focus area of the ratings agencies), has been warning about the deteriorating economic, political and commercial risk outlooks in these countries for many months. For example, we have been warning since last year about the fragile economic outlooks and the risks entailed in the rising fiscal imbalances in Euroland. Deteriorating public finances are a result of the large fiscal stimulus packages adopted across Euroland as well as the deep recession that has lowered tax revenues and increased welfare costs. Moreover, the euro-zone lacks both a centralised fiscal system and high levels of labour mobility that could help the currency union to adjust to the asymmetric shock it is currently facing, whereby some member states (the PIIGS) have been hit harder than the others by the debt crisis. Across the euro-zone concerns are mounting over the ability of governments to fund their fiscal deficits. The public debt problems in Greece provide an extreme example, but most governments require significant deficit funding this year and competition for funds is likely to push up yields and risks, crowding out long-term lending to businesses. The emerging debt crisis has eroded financial investor confidence, increased uncertainty about the euro and raised the risk that euro-zone countries will need to access external help (from the IMF and/or other euro-zone countries) to refinance their spiralling debts. This, in turn, is also affecting the availability of credit to the private sector, with risk premiums rising not only on government bonds but also on corporate bonds in the most vulnerable countries. All countries in the euro-zone face the need to tackle their rising public debt burdens; however, the most affected countries remain Greece, Portugal and Spain, and to a slightly lesser extent Ireland and Italy. What we are witnessing now is a serious crisis of confidence in the ability of the PIIGS to refinance their large public debt burdens. In late April, the Greek government initiated proceedings to access a EUR45bn rescue package from the EU and IMF. This step had become necessary as interest rates on Greek debt had climbed to unsustainable levels as investor confidence in the country had evaporated. However, Greece’s move also raised serious contagion risks for the euro-zone as a whole, reflected in the sharp increase in borrowing costs for these countries. Investors fear that the other PIIGS, which face similar structural problems, will soon run into similar funding problems as Greece. These structural problems include: weak export competitiveness, the inability to devalue their currencies (as these countries are in the euro-zone), rising unemployment, high household indebtedness, and a proneness to serious social unrest in protest at the governments’ fiscal austerity measures. Outlook: What Will Happen Next? We expect the following risk factors to play a key role in the sovereign debt crisis in the euro-zone in the next couple of weeks: the political willingness among euro-zone countries (especially Germany) to go ahead with the emergency loans for Greece, the ability of the other PIIGS to raise funds without external support, the effect of the public finance problems on the corporate sector, rising political risks, and increasing exchange rate risks. 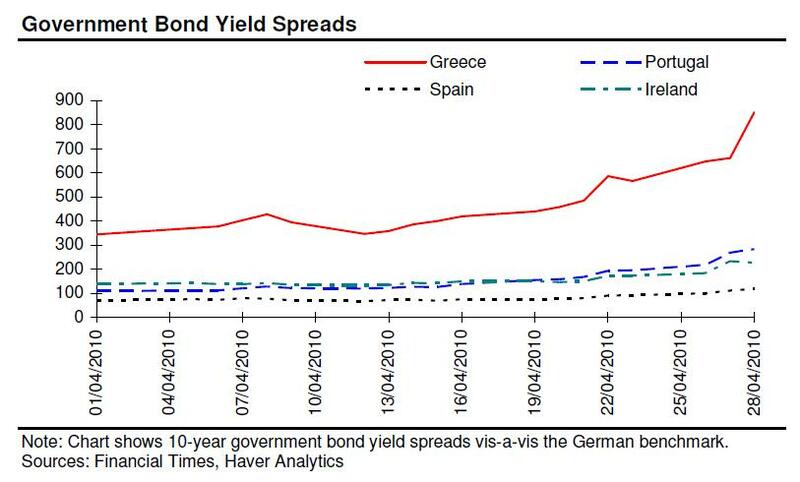 There are also now growing contagion risks from the euro area’s debt problems, even beyond the PIIGS. 1. Greece’s immediate ability to refinance its maturing debts depends on EU agreement for the provision of EUR30bn of a joint EU- MF rescue package worth EUR45bn. Germany (which has to contribute the lion’s share of the funds) faces a political dilemma as the German public is opposed to providing loans to Greece; there might also be challenges before Germany’s constitutional court if the support package goes ahead. Greece needs to pay investors EUR8bn on 19th May as well as a further EUR30bn by the end of this year and EUR28bn by the end of 2011. Overall, Greece might need much more than the planned EUR45bn package in external aid (new estimates suggest as much as EUR120bn) in the next couple of years. Although we believe the country will be able to access short- erm emergency loans from its partners for this year, the country’s debt burden will remain a source of concern in the medium term. The risk of default remains contained, but default cannot be ruled out beyond 2011 if political support in key euro-zone partners (especially Germany) drops significantly. 2. The other PIIGS will also face rising borrowing costs as markets will continue to fear that external support (especially from the IMF) will also be necessary for these countries. Disappointing demand for six-month Italian treasury bills recently highlights that debt refinancing in the PIIGS will be increasingly challenging. There is also a risk of ‘moral hazard’, whereby countries that have not yet received IMF support will not implement sufficiently strict fiscal austerity measures on the assumption that eventually the EU and/or the IMF will bail them out. 3. Companies face further stock price declines and rising costs for insuring against default (reflected in prices for credit default swaps), especially in Greece, Portugal and Spain. This means that companies will face increasing cash flow problems as their market capitalisation and profitability decline. The Greek government, for example, has outstanding securities of around EUR290bn, over twice those of US investment bank Lehman Brothers when it went bankrupt in late 2008. 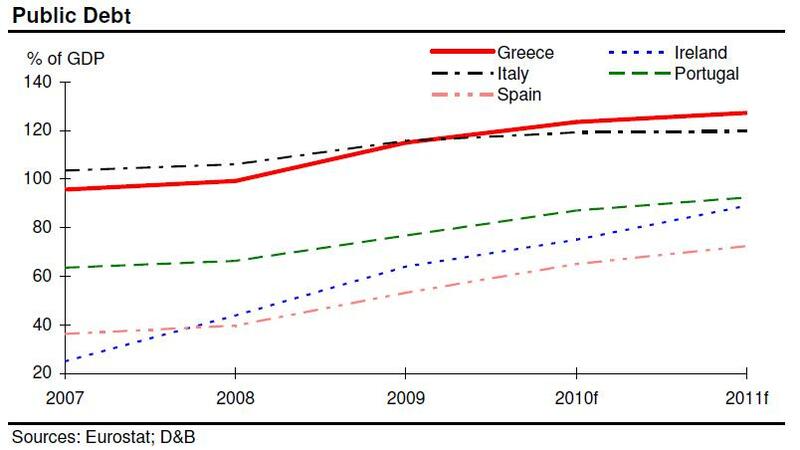 The fact that Greek government bonds are mostly held by Western European banks helps to create stock market tensions across the euro-zone: as investors are losing trust in Greek government debt paper, banks’ balance sheets look much more risky (especially if they include large amounts of government debt), which, in turn, threatens to make banks more reluctant to lend to households and businesses. These tensions could eventually trigger another credit crunch, especially if Spain and Italy face increasing financing problems (signs of which are already emerging). 4. The pressure on governments to implement strict fiscal austerity plans (exacerbated by pressure from debt investors, other EU countries and, in Greece’s case, the IMF) could also lead to a prolonged recession: as euro-zone members cannot devalue their currencies to correct internal and external imbalances, the EU and the IMF will impose strict fiscal consolidation measures (including dramatic wage and public spending cuts). These measures could stifle domestic demand at a time when the economic recovery in the euro-zone is already at a weak level. 5. Political risk will remain a problem. Civil unrest (especially in Greece) has already had negative implications for businesses operating in the most vulnerable countries. Widespread strikes threaten to paralyse daily life in the countries affected and their governments’ ability to implement fiscal policies and broader structural reforms, particularly in Greece and Portugal. Moreover, policy-making will remain problematic in most PIIGS. For example, the current minority government in Portugal needs to find partners among the opposition parties to pass legislation, which could hamper implementation of the fiscal plan. The Portuguese austerity plan has already triggered industrial action by trade unions, and we expect further social unrest as unions protest against spending cuts and pay freezes. 6. Finally, the debt problem in the euro area will keep currency volatility at high levels: the debt crisis has already led to a significant depreciation of the euro; the risk of further exchange rate volatility increases uncertainty in trade and investment dealings with euro- zone countries. The sovereign debt crisis in Euroland can have manifold implications for companies. There are several potential risks and opportunities for companies exposed to the PIIGS, in particular, and other euro-zone countries in general. Companies should bear in mind the deteriorating payments trends, a weak economic outlook, the opportunities deriving from privatisation programmes and heightened exchange rate volatility. 1. Companies exposed to Greece and the other PIIGS will have to be extremely vigilant as counterparty risk (such as insolvency risk and payment risks) will remain at heightened levels throughout 2010-11. D&B’s cross-border payments data (recording trends for intra-European trade) show that the payments performance of companies in Portugal and Spain in particular deteriorated sharply in Q1, while it remained weak in Ireland and Italy. We expect payments performance in the PIIGS to deteriorate further as credit conditions will remain tight, while business profitability will remain muted. 2. We expect the economic recoveries in the PIIGS to be very fragile in 2010-11. Indeed, the Greek, Irish and Spanish economies are likely to contract again in 2010, while economic growth in Italy and Portugal will only be shallow. Hence, economic prospects for potential investors in these markets are not very promising in the short term. For example, as public spending projects are delayed or scrapped, opportunities for investment in infrastructure projects (a key area of investment in recent years) will deteriorate. 3. However, the economic and fiscal crises in the PIIGS will also offer some opportunities. For example, as part of its fiscal measures to reduce its debt burden, the Portuguese government plans to raise EUR6bn through a privatisation programme, particularly in the airline, rail transport, postal, energy and paper industries. This and similar privatisation programmes that have been and will be adopted in the PIIGS will open the doors for some investors. There are also some niche industries, such as the growing renewable energy industry in Portugal, that will continue to offer opportunities for astute investors. 4. The heightened volatility in the currency markets raises uncertainty about trade and investment returns. However, if the decline of the euro continues (which we think is likely in the short term), this would raise revenues for exporters from the eurozone. The export sector has been the key driver of the nascent recovery in Euroland and a weaker euro will boost export price competitiveness further. However, exporters from non-Euroland European countries will lose competitiveness if their currencies appreciate vis-a-vis the euro; for example, the Swiss franc has appreciated markedly against the euro, posing a significant risk to Switzerland’s export recovery. We advise companies to remain vigilant with regard to currency movements.